They are the most common species of the genus Bothriechis, the green palm-pitvipers, and are very often present in zoo exhibits. The species-specific name "schlegelii" was attributed in honor of the German ornithologist, Hermann Schlegel. ​They are also known by other common names like eyelash pit viper, eyelash palm viper, eyelash palm-pitviper, Schlegel's pit viper, Schlegel's viper, Schlegel's palm viper, eyelash lancehead, eyelash snake, eyelash mountain viper and horned palm viper. The eyelash viper range extends from southern parts of Mexico on the Atlantic plains and lowlands through Central America to northern regions of South America in Venezuela and Colombia. The species is also found in the lowlands and Pacific versant in parts of Costa Rica, Colombia, Panama, Peru, and Ecuador. Their habitat ranges from tropical rainforests, wooded cloud and montane forests to dense sea-level forests or streamside vegetation in lowlands and foothills. These are arboreal snakes meaning they spend their lives in trees, palms, shrubs and vines and they usually prefer to stay near a permanent water source. The eyelash pit viper occurs at elevations from sea level up to 2600 meters in altitude. They use their prehensile tail to move around trees and foliage. The Eyelash viper, like all pit vipers, possesses heat sensitive organs, called pits, located on either side of the head, between the eyes and nostrils. These pit organs are complex structures that allow them to find potential prey by their body heat, a great evolutionary adaptation to a predator that hunts mainly at night. These small and arboreal snakes are characterized by a wide array of color variations, as well as the superciliary scales over the eyes from which derives their common name. These "eyelashes" are believed to help the snake's camouflage among the foliage where they hide. Their color varies greatly ranging from red, brown, yellow, green or even pink, very often with black or brown speckling, the base color is usually dependent on the snake's geographic location. They have keeled scales that feel rough and sharp to the touch. The eyelash viper is considered a small to medium-sized pit viper and is one of the smallest venomous snakes found in Central America. Typically females are longer than males measuring 35 to 82 cm while males measure around 37 to 69 cm in length. Because of their arboreal nature, the eyelash pit viper weighs less and is considerably shorter than the more terrestrial pit vipers like the bushmaster or fer-de-lance. They have a wide and triangular shaped head, and also have a very good binocular vision and vertical pupils. While their longevity in captivity may exceed 16 years their estimated lifespan in the wild is approximately 10 years. Some of their predators include large mammals like hedgehogs, badgers, foxes but also other snakes, fish, birds of prey and of course humans. Presently there aren't any subspecies recognized. Even so, some scientists recognize a montane form of the eyelash viper found in the province of San José in Costa Rica. Referred to as the eyelash mountain viper or the blotched palm-pitviper, it is either considered a full species (B. supraciliaris) or a subspecies (B. s. supraciliaris). The eyelash viper venom is mainly hemotoxic but also neurotoxic, containing procoagulants and hemorrhagic compounds. It affects both the cardiovascular system and the central nervous system, making it highly toxic, and even fatal to humans. They inject the venom using their 2 extremely long fangs, located on the upper law, these remain folded back into their mouth when they're not in use. 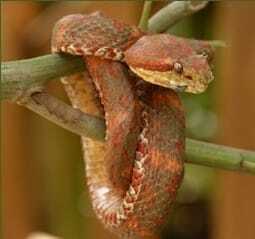 While they are not considered aggressive snakes, eyelash pit vipers have bitten humans who venture too close. The bite can cause severe pain, swelling, bruising, bleb formation and very often necrosis, if left untreated it can lead to loss of a limb, or even be fatal. An adult eyelash viper preys on small mammals, birds and nestlings, lizards, frogs, bats, rodents, and marsupials. While the juvenile snakes prey primarily on small frogs, sometimes using “caudal luring”, where they will wiggle their tail encouraging a potential prey to come within striking range. The eyelash pit viper is primarily a nocturnal predator, but during the day they are also capable of capturing moving prey like hovering hummingbirds. These snakes are known to return to a familiar ambush site so they can take advantage of birds spring migration. Like most pit vipers they are a typical "sit-and-wait" ambush type predator, attacking their prey by surprise and injecting their highly toxic hemotoxic and neurotoxic venom. Then they wait for the prey to die before swallowing it whole. The eyelash pit viper reaches sexual maturity at around 2 years of age, and they reproduce throughout the year in warm environments. They are a polygynous species, and mating usually takes place at night. The males engage in an amazing courtship ritual called “dance of the adders". In it, the 2 males try to intimidate one another with the head and the forepart of the body held upright in a “cobra-like” stance. This sometimes can go on for several hours, until one is pushed away to the ground, there is no biting in the ritual. The eyelash pit viper is an ovoviviparous species, the females incubate the eggs internally during the gestation period of approximately 6 months. After the gestation, the eggs hatch inside the mother's body, and the hatchlings are born live. Except for their body size, around 15 to 20 cm, the younglings are physically similar to adult snakes and are fully equipped and independent from birth. Females typically bear anywhere from 2 to 20 live young, per brood. 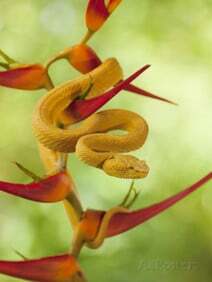 The eyelash viper has not yet been evaluated by the IUCN Red List. The species was removed from CITES Appendix III in 2002, they are no longer listed as threatened species. But even though they aren't listed as threatened, the species like many others faces the risk of habitat loss and degradation from deforestation for timber, agriculture or urbanization.